Eight years since its announcement and four years since its release I finally got around to playing Rage, the last game from id Software before they were absorbed into Zenimax and waved goodbye to John Carmack. If you want a single game that demonstrates all of id’s historic strengths (aside from multiplayer) in a modern user-friendly form factor, Rage fits the bill admirably. It has a rock solid engine, richly detailed environments, instinctual combat and never takes itself too seriously. Rage is also worthy of study because it’s a folly. Grand projects built on slightly irregular foundations – but which still somehow manage to be convincingly completed, if only by dint of unlimited resources and ingenuity being poured into them – are always more interesting to my mind than those that have gone strictly to plan. From Rage’s many quirks we can infer a lot about how id worked as a studio. While I’m loath to call any of their output “tech demos”, obviously they were a technology-led company. Carmack’s strategy here, as with all their games, was to set ambitious goals for the engine technology (and as an essential by-product of this, the art used to showcase it), while strictly constraining simulation complexity and gameplay depth to the functional minimum. Doom, Quake and Quake 3 Arena are the best examples of this strategy paying off handsomely. Each of these games significantly influenced the future direction of games (and graphics hardware in the latter cases), and provided a solid foundation for id’s engine licensees and modders to build an impressive body of work (including Half-Life and Call of Duty). 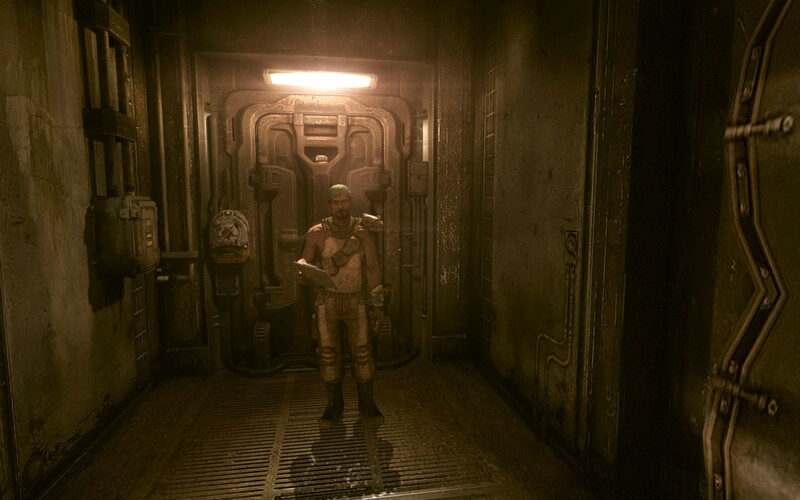 Doom 3 was an example of the strategy misfiring. 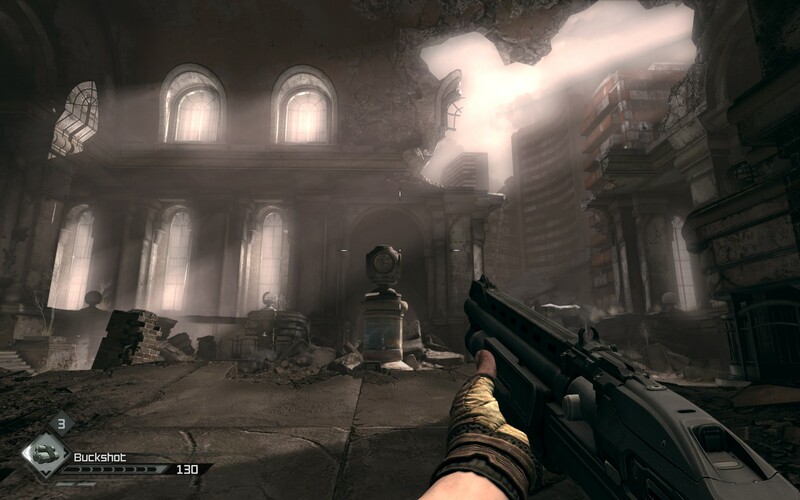 While the graphical upgrade from the previous engine was considerable, the trade-offs on what the designers could do with the engine were oppressive. The linear, repetitive corridor spook-house template already felt tired at the start of the game’s five year development cycle. Rage, thankfully, is a return to form – although it’s nowhere near the unqualified success of Doom or Quake. Carmack makes tools to empower artists, and didn’t make much of a secret that it was the unprecedented freedom that idTech 5’s megatexturing technology would give to environment artists that was his primary motivator in this project, rather than trying to convincingly break into the open world genre, or tell a story, or make a driving game. The point of megatexturing is that it allows every surface in the game world to have a unique texture. Level artists are freed up from having to worry about budgeting texture memory, and ugly, immersion-breaking repeating textures are banished. Artists can go wild building levels in ridiculously high geometric and texture detail, and the tech chews up those terabytes of data and spits out something that can be piped from a HDD (or even a DVD) in real-time without ugly compression artifacts or pop-in. The Xbox 360 and PS3 versions naturally look like a dog’s dinner, but at the time the fact that the game could run at all on such decrepit hardware (at 60fps no less) would have been a major selling point for publishers. While this goal was (just barely) achieved, the limitations that it imposed on the game (not least splitting the game’s open world into two separate DVD-sized areas) are in retrospect hugely frustrating. It absolutely cripples the driving sections of the game – streaming in scenery is such a burden on the puny DVD drives (thanks Microsoft for making running off a disc a mandatory requirement on Xbox 360 for years, you chumps) that camera movement is locked to one axis and vehicles are almost glued to the ground to avoid having to render anything unexpected. It’s tantalising to imagine what id could have achieved with Rage if they’d somehow found a way to string out its development into the current console/PC generation, although by then we’d be talking of a development time to rival Duke Nukem Forever and which would probably have invited a similar level of ridicule. Unfortunate timing is sadly sometimes unavoidable in an industry that progresses through long, slow technological cycles. 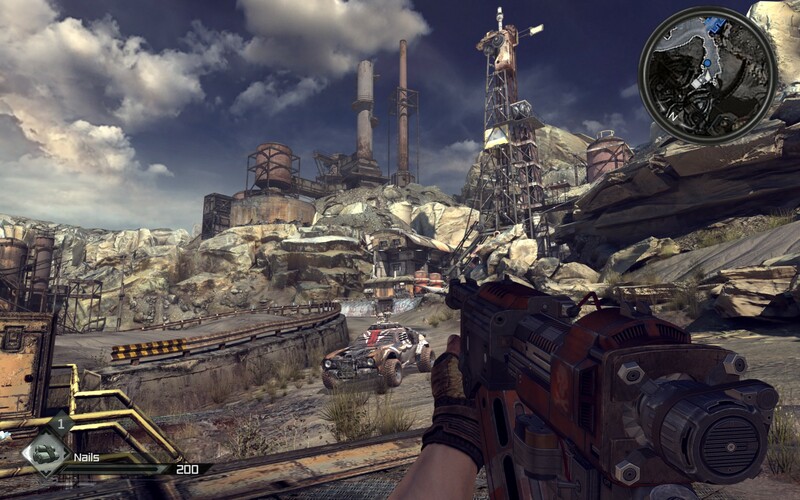 Rage’s game mechanics, world and fiction are moulded around the high concept cooked up by id’s art department circa ’07. The technology calls for static conditions, with no variable weather or even a day/night cycle. Sprawling and detailed landscapes are needed, but with the minimum of vegetation (Rage is the antithesis of the spit-and-sellotape perceptual trickery found in the Far Cry series and other ‘outdoorsy’ games) and wandering inhabitants. The target console spec isn’t up to the job of making a completely seamless world, so there needs to be a good rationale for the world to contain smaller, self-contained indoor areas that function more like traditional FPS levels. The result is a post-apocalyptic desert world, stuffed with eclectic visual influences ranging from the Old West and vintage car culture to science fiction and fantasy. While Rage’s designers may have been playing second fiddle to the artists and animators, that’s not to belittle their efforts. Rage somehow hangs together as a coherent experience in spite of aiming to be half a dozen different games at the same time. There are whole branches of (clearly expensively produced and deeply pondered over) content that have only a peripheral impact on the player’s experience. There’s a whole ‘game within a game’ of circuit racing and competitive car combat that can (after a couple of mandatory tasks) be completely ignored. Car ‘dogfights’ encountered in the wasteland are so brief and devoid of jeopardy that they quickly become irritations to be plodded through or sped past. The hub towns are full of ponderous gambling minigames played for penny stakes, and offer Job Boards of optional sidequests that are rapidly burnt through and then seldom if ever replenished. 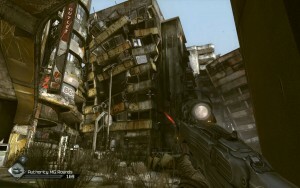 Elaborate (hand-animated) character scenes and sets are used once or twice to deliver a new mission objective and then discarded. There’s a Running Man-inspired fighting arena that most players will run through once as the story demands and then never set foot in again. There’s even a (poorly explained) collectible card game. Some of these boondoggles (as well as some systems that do add meaningfully to the game, such as the crafting system) hint that some ‘Broussarding’ may have been going on – feature creep driven by undue concern of innovations appearing in games released since the beginning of development. id’s designers must have been greatly influenced by contemporary critical darlings (Oblivion, Bioshock and the HL2 episodes being obvious ones) and decided that some of the fashionable features that they introduced would become baseline expectations for gamers on the ‘next-gen’ consoles. Experienced out of its contemporary context, the first thing that hits you about Rage is how concerned it is with demonstrating to the player that it’s not a linear FPS. 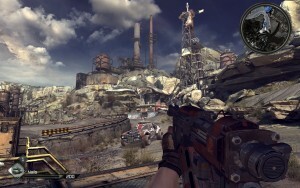 The opening hours of the game involve interminable traipsing between NPCs to trigger conversations, tick off minigames and tutorials and initiate fetch quests. Rage isn’t really an ‘open world’ game by the modern definition. Rather, it follows in the noble tradition of first-person shooters pretending to be RPGs exemplified by games like Hexen and Kingpin. The Wasteland feels like quite a small and occluded area (by open world terms – for an FPS level it’s huge) with extremely few points of interest scattered around beyond entrances to mission areas. There very rarely any reason to travel on foot or to take a detour from heading to the next mission objective. The second thing that hits you is how little sense Rage’s world fiction makes. The game’s premise is that Earth has been hit by the asteroid Apophis in 2029, wiping out most of civilisation. In the years prior to this catastrophe, Fallout-style cryogenic arks have been buried all over the world, set to emerge at such time conditions have stabilised to re-establish an organised society. Unbeknownst to anyone at the time, a power-hungry military dude has secretly set the alarm to go off early on the Arks containing his people, so that when your ark is opened (106 years after doomsday), they’re already well on the way to establishing a technologically advanced totalitarian regime. While this is the official timeline that the game presents, it seems that during development it’s been taken that the doomsday event actually happened “in Doom 3 times” rather than a couple of decades in the future – pre-fall civilisation had perfected cybernetic limbs, medical nanotechnology, antigravity, energy weapons and of course cryogenics as these all exist and are commonly encountered in the (supposedly resource-scarce and physically isolated) Wasteland environment. Observant readers may also have clocked that Rage’s apocalyptic event wasn’t a nuclear holocaust, and yet a large proportion of the enemies that are encountered are hideously deformed mutants. The game offers up the rather daft explanation that the Authority created the mutants as the result of failed genetic experiments. We’ve now been spoilt by many years of mainstream action/adventure games that have made believable worlds and emotionally complex (and professionally performed) characters their major selling points. (The Last of Us, Wolfenstein, Far Cry and Batman Arkham spring to mind as worlds I’ve spent a fair amount of time in over the last couple of years – you can probably name a dozen others.) The bar was set a lot lower when Rage was being developed, but even by 2011 standards it’s a bit of a mess. Rage boasts a big-budget Bethesda voice cast, but doesn’t have a particularly coherent story it wants to tell or themes to explore. John Goodman is wasted voicing the quest giver in the opening tutorial town. There’s no villain (or even Dr. Breen-like figurehead) to focus what the player’s efforts are working toward. There’s a perfunctory attempt to give the player a gang of comrades in the final act (compared to the lengths that MachineGames went to to humanise Blazko’s resistance colleagues in Wolfenstein:TNO this comes off as very weak indeed). The Grand Vision (Look amazing! Get to the action fast! Don’t let any player get confused!) dictates that the player is thawed out of their cryogenic bunker and almost immediately integrated into the power structure of the Wasteland society, given weapons, vehicles and entrusted with the safety of a town of settlers who he has met minutes before. The stock explanation for the exceptional way that the player character is treated is that Ark Survivors are seen as a rare commodity in the Wasteland, but this only ever works in the player’s favour and never carries any dramatic import. There’s constant chatter about how the Authority (the game’s Empire/Combine analogue) pay handsome bounties for captured Ark Survivors, but at no point does any named character try to cross the player in any way. 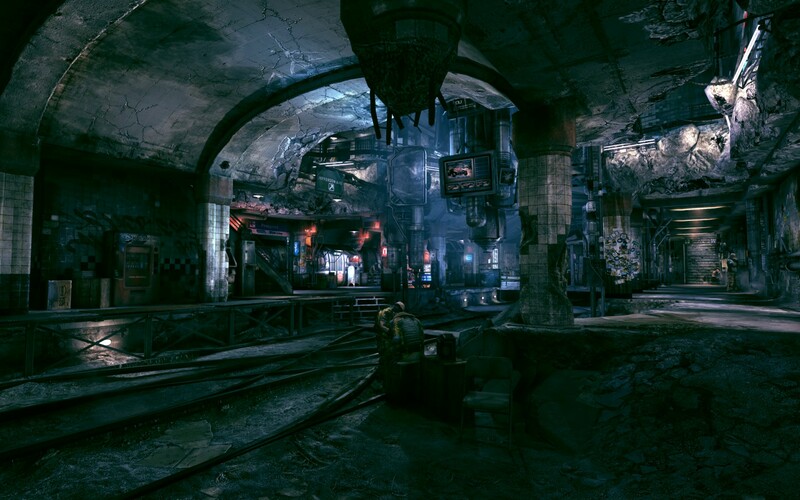 As with many post-apocalyptic games, Rage is largely the tech tinkerer’s survivalist daydream about how their talents would make them valuable and formidable in extreme conditions. The id guys and gals like fast cars, rockets and guns. Customising guns, building gadgets and tuning up your war buggy are the main forms of character progression. Superior might and knowledge are the most prized traits in the Wasteland society and are always rewarded. Your only value in this society is your ability to mete out violence. The whole ‘rugged individualism’ schtick has a positive gameplay outcome. Once you get away from the hub towns with their Gordon Freeman/Master Chief/You-Are-The-Chosen-One blather, and are out on a mission where it’s just you and the limited amount of equipment and ammo you’ve managed to scavenge or barter for, it’s possible for things to go badly wrong, and for it to feel like it’s down to your decisions. In one of the early missions clearing out a bandit hideout (which is what most of the missions boil down to, come to think of it) I found myself reduced to having to bum-rush oncoming waves of grunts with melee attacks, conserving the last of my revolver ammo to deal with a boss hiding in a heavily armoured gun emplacement. The game doesn’t do the Valve thing of laying out a trestle table of ammo crates and medikits in every other room. And between the weapons, ammo types and gadgets you can craft (wingsticks, sentry turrets and bots, RC bomb cars, mind control crossbow bolts, adrenaline boosts and much more) there’s a lot of scope for developing your own playing style. What’s rather less fun is that intentionally or not, all the activities the game offers that aren’t running through shooter levels and killing stuff become chores by comparison. These days we know that one of the great strengths of open world games are that you can give the player almost unlimited freedom from the outset. In Rage, you have to perform some mandatory busywork before you can earn access to the next fun part of the game. It feels like padding rather than legitimate depth. Given the scope for gory horror that a post-apocalyptic setting provides, the game is surprisingly restrained. (My understanding is that when the game was planned to be published by EA, they were aiming for a ‘Teen’ age rating, and while the finished article does reinstate some of the gibs and gore, the setting is still quite PG-13.) Rage’s world has little of the barbarity and bleakness of The Last of Us, The Road or even Mad Max. While past and ongoing conflict are hinted at (society has arranged itself into the four clear strata of Authority, Settlers, Bandits and Mutants which for the most part keep to themselves), the survivors appear to be law abiding and suffering no obvious scarcity of resources (food, water, medicine, gasoline and electricity are available in relative abundance and there’s a functioning cash economy, as well as radio and television broadcasts). 1. Technology and resources are at a level that nobody would need to live the Wasteland settler lifestyle unless they chose to. 2. There’s an abundance of thrilling and fun activities (racing! shooting! gambling! urban exploration! ), and little time spent on less appealing traditional post-apocalyptic staples like cooking rats and dying of radiation sickness. 3. We never see the world beyond a few square miles of the desert (although it’s made clear that travel between cities and countries is still possible). 5. And of course, everyone treats you like the hero. Wellspring (disc 1’s hub town), the scene used in many of the teaser trailers in the years before the game’s release, still looks impressive today, albeit with quite a lot of forced occlusion and some dubious texture resolutions on bits of scenery for which later games would probably use dedicated models. Wellspring is one of the areas in the game that tries hardest to feel like a tangible, lived-in place, with lots of building interiors and unique named NPCs going about their business. But it’s also making an aesthetic statement of intent – there’s lots of brightly painted hissing and clanking machinery and quirky Mad Max-style makeshift architecture. It feels like a logical progression from the flashier Quake III levels like Deva Station. 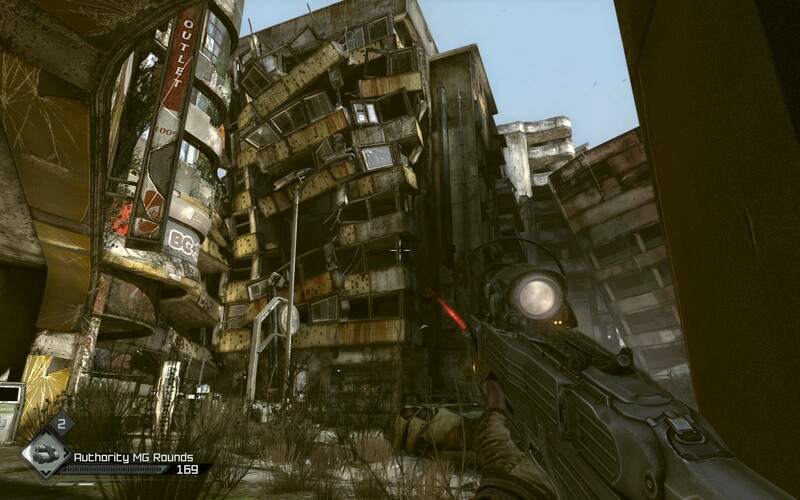 The Dead City is one of the major spectacles in the first half of the game, showing off what the tech is capable of by bringing intricately detailed collapsed skyscrapers out of the skybox and into the playing area. The influence that this level had on similar areas in The Last of Us is clear to see. It’s one of the rare areas in the game that really feels like it’s hostile to human intrusion. 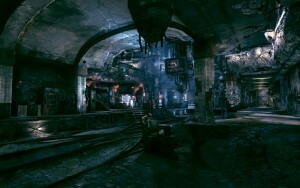 The Blue Line Station (the dungeon below Subway Town, the hub of the second half of the game) leads the player on a twisting route through a cavernous ruined railway station complex, where it never feels possible to cover all the exits. By this point the artists seem well accustomed to scattering massive amounts of geometrically-modelled debris around and having idTech do its magic – the collapsed brick walls in the flooded bathroom are particularly good. Jackal Canyon is a rare instance of an on-foot section of the game taking place in the desert, with lots of use of verticality and a challenging gauntlet for the (by now tooled-up) player to pit their skills against. Finally be sure to pay a visit to the Distillery, a self-contained derelict factory setting that’s only used for a couple of side missions, and yet has a unique, twilit monochromatic look that sets it apart from anywhere else in the game. 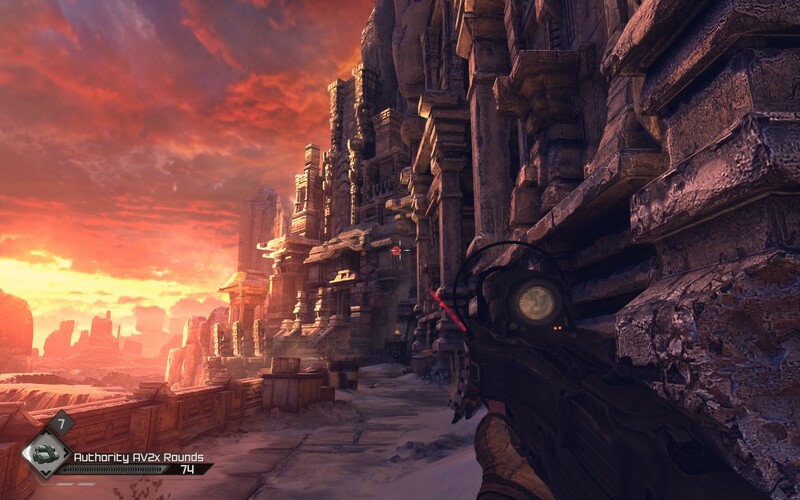 Rage is probably the last game that will ever look quite like it does. While the megatexture tech was ahead of its time, the artists were still building and dressing their worlds with old techniques. It sometimes feels like you’re exploring a scale model with concept art papier-mached to the walls with varying degrees of success, whereas increasingly modern games are moving toward photogrammetry and similar techniques to sample real-world architecture and scenery. As we edge closer toward VR it will be interesting to see if this uncanniness becomes more noticeable. However the real stars of the show are the mutants, who are essentially version 2.0 of the acrobatic imps from Doom 3. They swing from rafters, roll behind cover, vault bannisters and launch themselves from doorways. They also get knocked back and react to being shot based on where they were hit. You can constantly get a read on their status just by watching them move. They’re like the ganados in Resident Evil 4, in a way, except rather a lot faster and capable of coming at you from any angle. All ornamentation aside, the combat is the meat of the game, and the thing that most critics agree is the thing that the game unequivocally gets right. There are echoes of Doom in that player movement and circle-strafing are important again, and that you have to consider the stopping power of your different weapons to effect crowd management. It keeps the tension up by typically throwing just a few more enemies than you can deal with without having to scamper off to take cover and reload, and doesn’t respawn enemies endlessly. You often have the option of using Pop Rockets (high explosive shotgun shells) to one-shot kill troublesome enemies, although with the built-in penalty that gibbed enemies don’t drop loot. One snag is that once you have high powered long range weapons later in the game, it becomes a bit too easy to cheese the AI and pick off distant bandits as they fail to properly use cover. The combat can sometimes be made more frustrating that necessary for mouse and keyboard users thanks to the fiddly and poorly explained shortcut menu system. Seriously: I’ve completed the game and I still don’t fully understand how it’s supposed to work. You have a limited number of shortcut keys (presumably mapping to the dpad on a joypad) for using items in combat, and something similar for weapons and ammo types. It seems to be impossible to access some items and ammo types with a single keypress, instead having to slowly cycle through options or jumping out to the pause menu. If this wasn’t bad enough, mouse controls in in-game menus (such as shops, the garage and the job board) are incredibly slow and clunky, which is all the more inexplicable when you consider how slick these subsystems were in Doom 3. 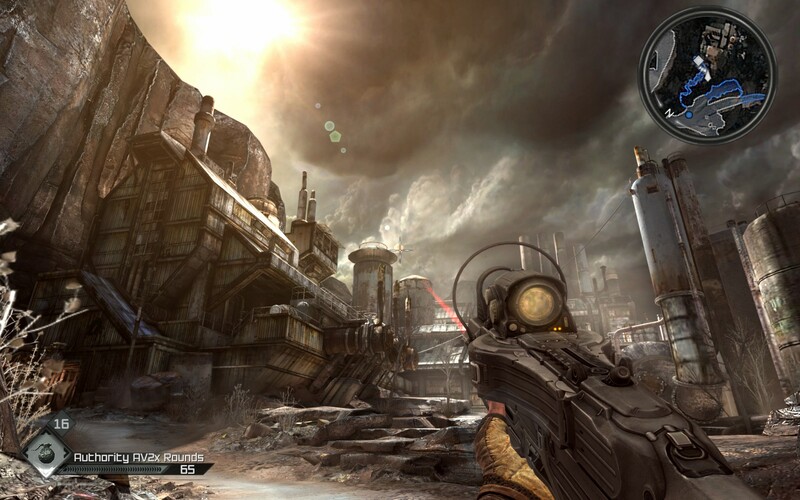 Thankfully MachineGames took all this out behind the barn and shot it when it came to design the UI for Wolfenstein. Regular readers of this blog will know that I’m a lifelong id Software fan, and probably willing to give them the benefit of the doubt more than most. Rage is a long way from my favourite of their games, and I can see its flaws. With that in mind, if you like single player shooters, gawping at still-quite-pretty graphics, or just want to know why Carmack is regarded with such reverence as a graphics programmer (as I appreciate it’s hard for young people to appreciate the impact Doom and Quake had at the time of their release), Rage is worth a couple of evenings of your time. I would recommend getting The Scorchers DLC pack as well, as this basically adds a nice boss battle to make up for the game’s ending being so ridiculously abrupt.